Did you know it would only take you a few minutes a day to brush out your Mini Schnauzer? And in doing so, you help keep your Schnauzer's skin and coat healthy, shiny, and mat-free? That's right. It would only take you about 10 minutes to brush your dog out every day and the pay-offs are huge. There are so many benefits to brushing your dog, it just doesn't make sense not to. Brushing your dog is important for your Schnauzer's overall health as well. Mats and tangles in your dogs coat can lead to skin problems, irritations or rashes. And brushing provides you a great opportunity to check for any other health concerns that may need veterinary care before they manifest into bigger health problems. Bristle Brush This dog brush works well for everyday grooming. It removes dirt and distributes body oils nicely which shine and polish a dog's coat. Wire Pin Brush This dog brush is best for dogs with medium to long hair and for curly coats. It makes for a nice finishing tool. Slicker Brush This dog brush is used to break up tangles and mats in medium to long-haired dogs. And it's always good to use a flea comb which will help to remove loose undercoat hair, tangles, mats and to detect fleas, too. A good bristle brush (or finishing brush) is great for everyday use. It helps to remove dirt and gives dog's coat a polished shine. A pin brush is useful for daily brushing of your dog. It's a great tool to gently untangle and smooth out coat. A slicker brush removes dead hair, mats and tangles with minimal effort. Just be sure to use gentle strokes. A good grooming comb can be used on any type of coat to help remove loose undercoat hair, tangles, mats and other debris. And daily body checks for fleas are a breeze with use of a flea comb. 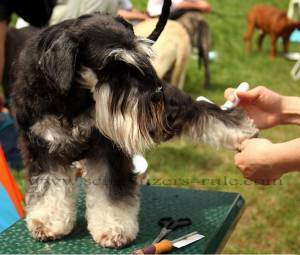 Brush Dog Daily - By brushing your Miniature Schnauzer out daily he will learn to accept the process. Be Gentle - While brushing, don't yank or pull on your Schnauzer's coat. Take your time and be gentle, particularly around sensitive areas like the face, ears, and tail. Speak Calmly - Never force or yell at your Schnauzer if he resists grooming. 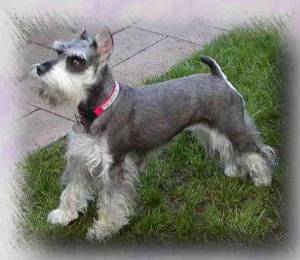 While brushing out your Miniature Schnauzer, speak to him in a calm sweet voice that's always reassuring. Create a Relaxing Atmosphere - Choose a comfortable place in your home to brush your Miniature Schnauzer. Have all the necessary tools on hand plus a few treats! You can also use Comfort Zone W/D.A.P. Diffuser which has been proven to reduce or completely stop stress-related behaviors. Reward the Activity - Reward your Schnauzer during and after grooming sessions so he begins to look forward to his daily dog brushing sessions. Whether you are brushing your Miniature Schnauzer on a table or the floor, be sure to put in place a soft, thick, comfy towel for him to lay down on, first. 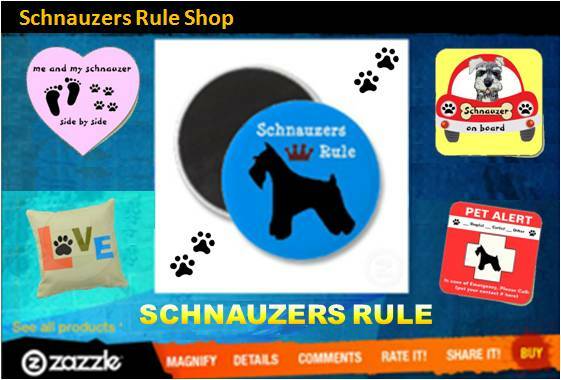 Now have your Schnauzer lie on one side and just start the process by using hand strokes only and begin speaking softly to him. This will relax your dog down a bit. Now take the bristle brush and begin with soft gentle strokes in an area of least sensitivity. Brush dog slowly and if you come across a mat, decide if its manageable or not. If you have a particularly difficult mat or tangle, the most humane thing to do is just cut it out. Your dog's hair will grow back out, so don't fret about it. Remember, you want your Miniature Schnauzer to enjoy the experience. But if you are going to try and get it out, at least use a detangling spray. Dog Brushing Tip: Always brush your Miniature Schnauzer out before a bath. Mats and tangles that get wet will tighten, making them that much harder remove. Only wet and rinse out matted areas that are caused by foods. Food stuck in your Schnauzer's beard may appear to be a bad tangle or mat but in actuality is nothing more than dried food or a sticky food that just needs to be washed out. Once one side is complete, have your Schnauzer turn over and repeat the process on the other side. You want to make sure you brush your Schnauzer's head, ears, beard, chest, front legs, back, sides,tummy, hindquarters, and tail. All the while checking for any skin problems that you may need to address with your vet. Dog Brushing Tip: Don't brush your dog too hard. Besides making your Schnauzer miserable and causing him pain it could irritate the area and cause a red rash or slicker burn under the coat or you could create an abrasion that lead to sores and hot spots. Remember, the more often you brush your Miniature Schnauzer, the less time you will spend doing it. You'll also catch all those nasty mats and tangles before they even have a chance to develop. Brushing your dog daily will also strengthen the trust and bond between you and your dog. Your Mini Schnauzer will learn to accept the dog brushing process as part of his daily routine and a special time the two of you share. Be sure to reward your dog big time with a yummy treat and perhaps a stroll around the neighborhood. You'll both enjoy the walk as you are sure to be the recipient of lots of compliments. Aroo!